Let me take you back to the morning of Saturday, September 27th, 2014. SMU Football had officially hit rock bottom. The Mustangs started the 2014-2015 season with three of the worst successive losses in program history, being outscored 146-12 by Baylor, North Texas, and Texas A&M in those games. Head coach June Jones resigned after the Mustangs were blown out by UNT 43-6 in Week 2, citing personal reasons as the cause of his departure. To make matters worse, SMU’s nemesis from Ft. Worth was on the bus to Dallas. TCU’s quarterback Trevone Boykin threw for four touchdowns and ran for two more. Receivers Deanté Gray, Kolby Listenbee and Josh Doctson combined for 217 receiving yards and three TDs. The Horned Frogs moved the ball 614 yards in total. TCU 56, SMU 0. Fast forward to September 2015, this time in Ft. Worth. With 8:20 left in the 4th quarter, SMU’s Chad Hedlund hits a 32 yard field goal. TCU 42, SMU 37. That’s right folks, the SMU Mustangs, who had been shutout the year before, were now within five points of the No. 3 team in the nation – on the road. Forget for a second that TCU eventually pulled away to win that game 56-37. With just eight months of Chad Morris’ coaching under their belt, the Mustangs went from being arguably the worst team in college football to coming a few big plays away from knocking off the third best team in the nation. Don’t get me wrong – the 2015 Mustangs were not a great football team. Much of Morris’ up-tempo spread genius could not be used to its full potential simply because the Mustangs did not have the depth to sustain it. SMU’s defense also gave up a total of 6026 yards and 548 total points. The only team scored on more than SMU was Kansas. Despite all of that, we cannot ignore that bringing home the Iron Skillet in 2015 was almost a thing. It certainly would have made SMU’s 2-10 finish look much better. TCU, for the foreseeable future, will be a better football team than SMU. It’s unfair to fault SMU for that; TCU has been committed to rebuilding their program since Gary Patterson took over as head coach in 2000. However, the Mustangs are conducting a rebuild of their own, and the stars are aligning to make this year’s Battle for the Iron Skillet must see football. In last year’s game, Trevone Boykin threw for 454 yards and five touchdowns. He also ran the ball for six once. Boykin now backs-up Russell Wilson in Seattle. That’s a good start. Two of Boykin’s TD passes were hauled in by his go-to receiver Josh Doctson. He went for 171 yards on only five catches. He now plays for the Redskins. Basically, the two players who combined for 36 of the 56 points TCU posted against SMU in 2015 now play in the NFL. Get the picture? Now of course, TCU has the resources to replace Boykin and Doctson’s production. KaVontae Turpin, Deanté Gray, Jaelan Austin, Taj Williams, Isaiah Graham and Ty Slanina will all combine to replicate that production. The Mustangs will also have to deal with former Texas A&M duel-threat QB Kenny Hill, who transferred to TCU last year and will most likely start for the Frogs in Ford Stadium. TCU will always have the resources to win, but the connection between Boykin and Doctson that proved so devastating for SMU is a thing of the past. Courtland Sutton might just be the most underrated receiver in the country, mostly because he was double-teamed on almost every play last season. Teams, including TCU, knew where Matt Davis would be throwing. Not anymore. SMU’s receiving core is stacked, and the unorthodox strategy of log-jamming Sutton will not fly. Alex Honey, James Proche and Xavier Castille are all valuable targets that will open up space for Sutton. Morris said during the Tempo Talk radio show Monday that freshman Myron Gailliard will also see action after an impressive spring. Upsetting TCU at home will not be easy. SMU must find a way to protect Matt Davis, contain Kenny Hill and prevent giving up big plays. But the Mustangs have a lot going for them – the game takes place on Family Weekend, on a Friday night, and is televised on ESPN. It’s going to have that big game feel. 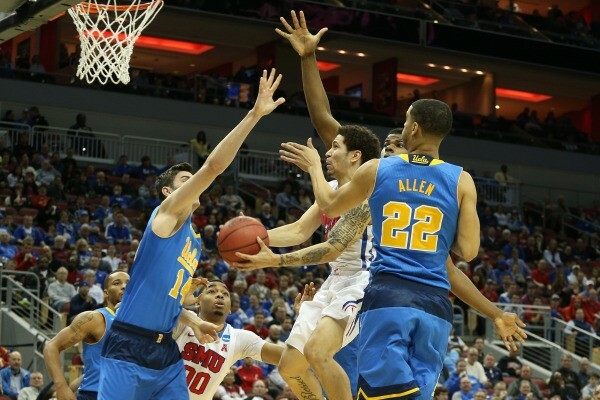 When Larry Brown and SMU Basketball took down #7 Cincinnati at home in 2014, we all knew the Mustangs had made it. This year’s Battle for the Iron Skillet could be the game that shows us Chad Morris and Co. have made it, or at least are getting closer. Let me clarify by saying that I am by no means calling an upset here. That being said, I will not be surprised if SMU somehow finds a way to pull this one off. SMU and TCU have questions to answer on both sides of the ball and this game could very well be competitive. The Mustangs’ current senior class has been outscored by TCU 160-54 during their time on The Hilltop. They want this win, and if there’s any truth to that old adage about superior will overcoming superior talent, this will be a game SMU fans cannot afford to miss.